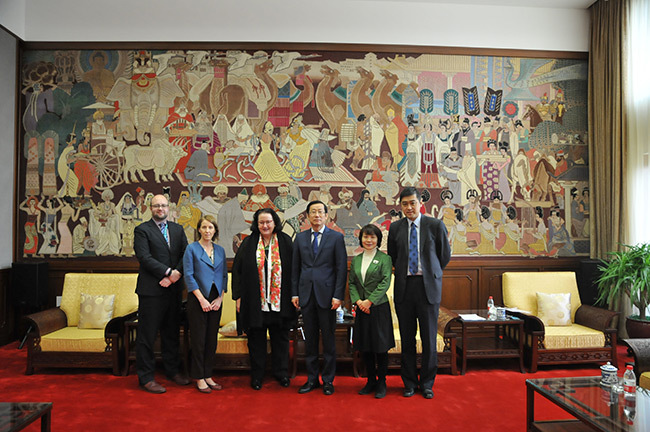 On the morning of 14 December, Rao Quan, Director of the National Library of China (NLC), met with Clare Fearnley, New Zealand Ambassador to China, and her delegation. Chen Ying, Deputy Director of the NLC, was also present. Rao Quan extended a warm welcome to Ambassador Fearnley and her delegation, introduced basic information and recent achievements of the NLC. He also reviewed previous exchanges between the NLC and the National Library of New Zealand (NLNZ), especially mentioned that the cooperation arrangement between the NLC and the NLNZ expired in December 2017. Rao Quan expected that a new collaboration agreement would be reached based on friendly consultation with the NLNZ, to promote exchange and cooperation continually between the two National Libraries. Ambassador Fearnley thanked Director Rao for the warm reception; she highly appreciated the NLC’s untiring endeavors and significant contributions for facilitating cultural exchange between New Zealand and China. The exhibition Boundless Love: Document Exhibition to Celebrate Rewi Alley’s 120th Birthday co-hosted by the NLC and the NLNZ in 2017, as Ambassador Fearnley stated, was an example of amicable exchange and cooperation between the two National Libraries. It has crucial meaning for deepening mutual understanding among peoples of China and New Zealand. Ambassador Fearnley hoped that both the NLC and the NLNZ could have more in-depth cooperation in various fields, while she cordially invited Director Rao to visit New Zealand, to visit the permanent exhibition of three iconic constitutional documents in the NLNZ.